BACKGROUND: Imatinib was the first BCR-ABL tyrosine kinase inhibitor (TKI) approved in the United States for the treatment of patients with chronic myelogenous leukemia and is currently the most prescribed TKI. The impending loss of patent exclusivity for imatinib has the potential to reduce costs for payers. OBJECTIVES: The primary objectives of this study were to estimate the economic impact of the loss of patent exclusivity for branded imatinib and to calculate the relative impact of requiring prior authorization (PA) for the use of generic imatinib before a branded TKI. The secondary objective was to evaluate the potential relative cost impact of using a preferred branded TKI in addition to the PA requirement for generic imatinib before a branded TKI. METHODS: A Microsoft Excel–based model was developed from the perspective of a US payer (commercial and Medicare) for a 2-year period. Data on utilization, patient out-of-pocket cost, and market share were obtained from an analysis of Truven Health MarketScan claims. It was assumed that the cost of generic imatinib would be 47.8% of the price of branded imatinib. It was assumed that 70% of patients receiving branded imatinib would shift to generic imatinib in year 1, and 95% would shift in year 2 after loss of patent exclusivity. Formulary management could be applied through PA requiring the use of generic imatinib before a branded TKI for patients newly prescribed TKI therapy. It was assumed that 74% of PA requests would be approved, and that the administrative cost of each would be $20. RESULTS: In a hypothetical 1 million member commercial plan, the loss of patent exclusivity for branded imatinib produced cost-savings of $6.8 million during 2 years, or 28.8% of the total pharmacy spending on the TKI class. The savings were even greater in a 1 million member Medicare plan, at $22.9 million (28.8%). Formulary management reduced incremental TKI spending by 1.1% and 2.2% for the commercial and Medicare plans, respectively. CONCLUSIONS: In the absence of formulary management beyond generic substitution, the loss of patent exclusivity for branded imatinib is expected to reduce total pharmacy spending on TKIs by nearly 33% during 2 years. Given the small number of newly treated patients, formulary management of the TKI class through restricted access to branded imatinib, with or without a preferred branded TKI, has limited potential for incremental cost-savings. Imatinib is the most frequently prescribed TKI, followed by second-generation TKIs dasatinib and nilotinib. Bosutinib and ponatinib were the latest TKIs to be approved by the FDA. TKIs are considered the treatment of choice for Ph-positive (Ph+) chronic-phase CML, and some TKIs are approved for the treatment of other conditions.10-14 Physicians in the United States also may prescribe TKIs off-label for conditions not approved by the FDA, if deemed medically appropriate. The manufacturer of branded imatinib is expected to lose patent exclusivity on January 25, 2016, and the first generic version of the drug is expected to be available on February 1, 2016.15,16 The entry of generic imatinib into the market could significantly reduce US health plan expenditures for TKI therapy and facilitate changes in the management of the TKI class by payers. The primary objectives of this study were to estimate the economic impact of the loss of patent exclusivity for branded imatinib and to gauge the relative economic impact of formulary restrictions requiring the use of generic imatinib before a branded TKI once the generic drug has been introduced. The secondary objective was to estimate the economic impact of requiring the use of a preferred branded TKI in addition to the prior authorization (PA) requirement for using generic imatinib before a branded TKI. To generate data on key model parameters of TKI utilization and market share, a healthcare claims analysis was conducted using Truven Health MarketScan Commercial and Medicare Supplemental Data. Patients were included in the analysis if they were aged ≥18 years and had at least 1 claim for a TKI (imatinib, dasatinib, nilotinib, bosutinib, or ponatinib) between July 1, 2012, and June 30, 2013. We decided that TKIs with less than 5% market share would be excluded from the subsequent analysis. Less than 1% of patients in the study sample received bosutinib or ponatinib; therefore, these TKIs were not considered further. The 1-year prevalence of patients receiving a TKI for any diagnosis, and for CML specifically, was measured per 100,000 patients. These calculations were made by dividing the number of enrollees with at least 1 prescription for imatinib, dasatinib, or nilotinib during the study period by the total number of enrollees in the plan during the study period, and multiplying the result by 100,000. The 1-year prevalence of patients receiving TKIs was stratified by health plan type (commercial or Medicare) and patient age (18-64 years or ≥65 years). The market share for each TKI was defined as the proportion of patients with the first TKI treatment observed during the 1-year study period. An estimate of TKI switching rates was determined through an analysis of data for TKI-treated CML patients who had a claim for more than 1 TKI during the study period. Switching rates were then used to estimate the size of the switching population. An interactive, Microsoft Excel–based model was developed to estimate the pharmacy budget impact of the loss of patent exclusivity for branded imatinib and the incremental impact of formulary restrictions on branded TKIs after the introduction of generic imatinib. The model was developed from a US commercial and Medicare payer perspective with a 2-year period after the introduction of generic imatinib. The TKIs included in the model were imatinib (branded and generic), dasatinib, and nilotinib. The model permitted analysis of the results by plan type (commercial or Medicare), form of patient cost-sharing (coinsurance or copayment), and price of generic imatinib with and without a 180-day exclusivity period. Two health plans, each with a population of 1 million members, were used in the model. The proportion of patients expected to be new to TKI therapy each year was estimated by applying the incidence rate of CML obtained from Surveillance, Epidemiology, and End Results (SEER) data2 to the 1-year incidence derived from the claims data analysis. The size of the switching population was estimated by applying the switching rate to TKI users who were not new to TKI therapy (existing TKI-treated patients); this was done by subtracting the number of newly treated patients from the overall population of TKI users. We assumed that 70% of patients receiving branded imatinib would switch to generic imatinib in year 1. For year 2, we assumed that 95% of patients would be treated with generic imatinib rather than branded imatinib. The market shares for dasatinib and nilotinib were assumed to remain constant throughout the study time horizon in the absence of formulary management. 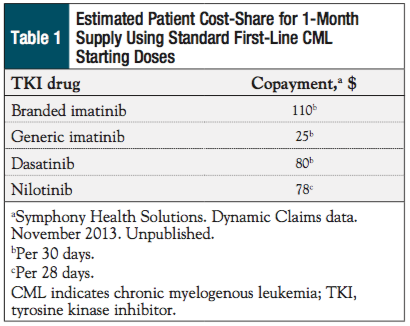 In the model base case, patient cost-sharing was defined as the mean out-of-pocket costs for a 1-month supply of each TKI, derived from claims data from the Symphony Health Solutions claims data set for medication dispensed between January 2013 and November 2013 (Table 1).18 The cap for maximum annual patient cost-sharing was based on the 2015 individual out-of-pocket maximum or limit for the health exchange insurance marketplace for a commercial plan ($6600) and on the 2015 Medicare Part D Standard Benefit Model Plan for a Medicare plan ($4700).19,20 The dose and frequency of administration for included TKIs were based on the labeled indications for Ph+ CML.10-12 We assumed standard first-line starting doses for the CML indication, and that there were no discontinuations, dose increases, or dose escalations in the modeled time horizon. Estimated drug costs and net annual costs were calculated from published wholesale acquisition costs of each TKI as of March 27, 2015 (Table 2).21 Generic imatinib was assumed to be priced at 47.8% of the brand price with no generic exclusivity period, based on an analysis of generic versus brand pricing for 146 unique molecules.22 The outcomes for the budget-impact analysis were incremental total cost-savings, incremental per-patient per-year cost, incremental per-member per-year cost, and incremental per-member per-month (PMPM) cost during the modeled time horizon. Costs were calculated in 2015 US dollars; because of the short time period of the study, they were not discounted. The base-case model to evaluate the primary and secondary objectives included TKI users across all diagnoses, assumed no generic exclusivity period, and considered a patient copayment (rather than coinsurance). Sensitivity analyses were conducted to evaluate the impact of modifying certain model parameters, including patient population (TKI users with a CML diagnosis vs all TKI users), 20% coinsurance versus copayment, and a 180-day period of marketing exclusivity for generic imatinib instead of no generic exclusivity. Records for the total sample of 46,758,906 adults (aged ≥18 years) were evaluated; 89.2% were aged 18 to 64 years and 90.3% had a commercial health plan. Of these, 5930 members received a TKI (branded imatinib, dasatinib, or nilotinib) for any diagnosis, representing a 1-year prevalence rate of 12.7 per 100,000 patients. Prevalence rates were higher for the Medicare subpopulation (34.7 per 100,000 patients) than the commercial subset (10.3 per 100,000 patients). The 1-year prevalence of TKI use in a commercial and Medicare plan, stratified by age, is presented in Table 3. More than 50% of patients receiving a TKI for any diagnosis were prescribed imatinib (69.1%); the remainder were prescribed dasatinib (18.2%) or nilotinib (12.8%). A similar pattern was found for patients with CML receiving a TKI: more than 50% received imatinib (59.4%), and the others received dasatinib (23.2%) or nilotinib (17.4%). 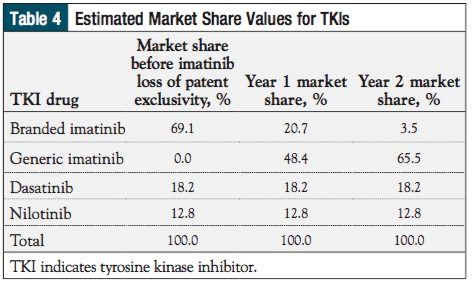 Table 4 shows current market shares and estimated market shares among all TKI users for years 1 and 2 after the introduction of generic imatinib. To estimate the number of patients who would be new to TKI therapy, the incidence rate of CML was applied to the 1-year prevalence. The annual incidence of CML was obtained from the SEER database and stratified by age range (0.90 per 100,000 in people aged 18-64 years, and 6.8 per 100,000 in people aged ≥65 years).2 This was compared with the prevalence of CML obtained from the claims analysis (6.27 per 100,000 in people aged 18-64 years, and 6.19 per 100,000 in people aged ≥65 years). The claims analysis showed that 98.6% of the commercial plan population and 1.7% of the Medicare plan population were aged 18 to 64 years, and 1.4% of the commercial plan members and 98.3% of the Medicare plan members were aged ≥65 years. It was, therefore, expected that approximately 15.9% of patients in the commercial plan and 33.7% of those in the Medicare plan would be new to therapy each year. This was calculated as (incident patients aged 18-64 years ∕ prevalent patients aged 18-64 years × % of those aged 18-64 years) + (incident patients aged ≥65 years ∕ prevalent patients aged ≥65 years × % of those aged ≥65 years). When this proportion is applied to the prevalence of TKI-treated patients (regardless of diagnosis)—a total population of 103 in a commercial plan and 347 in a Medicare plan of 1 million members each—the estimated number of patients newly treated with TKI therapy is 16 in the commercial plan and 117 in the Medicare plan. To estimate the number of patients who switched TKIs, the switching rate of 6.47% (derived from the claims analysis of CML patients) was applied to TKI users who were not new to therapy. For the commercial plan, 6 of the 87 patients who were not new TKI users were assumed to switch their TKI; for the Medicare plan, 15 of the 230 patients who were not new TKI users were assumed to switch their TKI. Altogether, 22 patients (16 new plus 6 switch) in the commercial plan and 132 patients (117 new plus 15 switch) in the Medicare plan would be subjected to formulary restrictions. Based on this model, the loss of patent exclusivity for imatinib, leading to switching from branded to generic imatinib, is expected to result in cost-savings for the commercial and Medicare plans, independent of additional formulary management. For commercial plans, the use of generic imatinib is expected to reduce the total TKI pharmacy spending by 28.8% for each plan, with cumulative 2-year savings of $6,840,427 ($0.29 PMPM) for a 1 million member commercial plan and $22,952,646 ($0.96 PMPM) for a 1 million member Medicare plan. The base-case model also suggests that formulary management strategies are expected to produce limited incremental cost-savings during the introduction of generic imatinib. 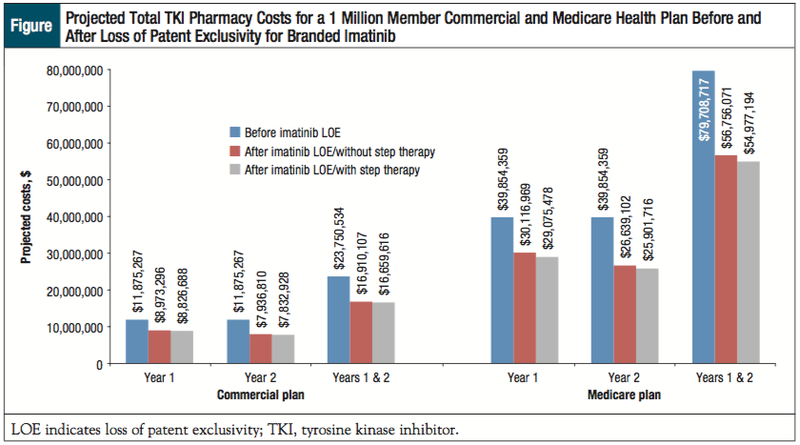 If a step therapy process requiring the use of generic imatinib for newly treated patients is implemented in a 1 million member commercial plan, the potential incremental pharmacy spending would be reduced by 1.1% of the total 2-year pharmacy TKI costs before the loss of patent exclusivity ($250,491); for a 1 million member Medicare plan, this step therapy process has the potential to reduce the incremental TKI pharmacy spending by 2.2% ($1,788,877; Figure). Results of the secondary objective to explore the cost impact for a health plan having a preferred branded TKI in addition to step therapy through generic imatinib are shown in Table 5. Overall, the savings from this combined approach are similar to the savings associated with step therapy alone in both health plans, resulting in an incremental TKI pharmacy spending reduction of 1.1% (commercial) and 2.2% (Medicare) for each step therapy scenario. Results of the sensitivity analyses for the primary objective are presented in Table 6. When the type of patient payment was modified from copayment to coinsurance, the reduction in total 2-year TKI pharmacy spending was even greater—30.7% and 30.2% for the commercial and Medicare plans, respectively, compared with the base-case reduction of 28.8% for each plan. The addition of a 180-day exclusivity period to the base-case model resulted in a reduction of 27.4% in total TKI pharmacy spend during the 2-year period for both health plans, which is slightly lower than the base-case reduction, because of the higher cost of generic imatinib during the generic exclusivity period. 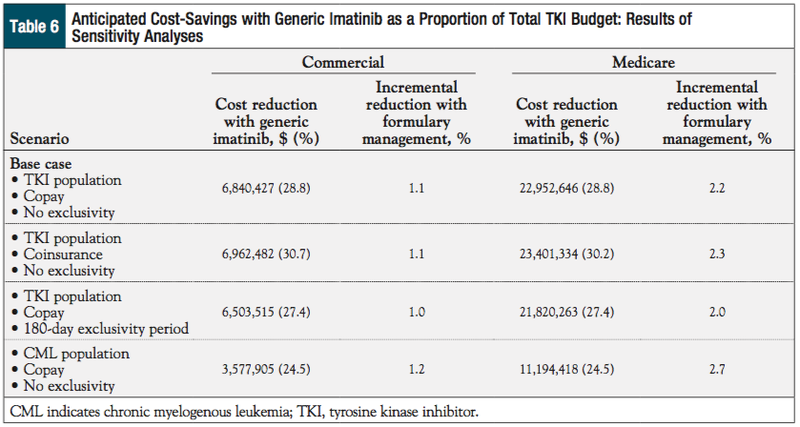 If the patient population is limited to TKI users with a CML diagnosis, the introduction of generic imatinib would be expected to reduce the total 2-year TKI pharmacy spending by 24.5% for both health plans. In each scenario, the impact of formulary management was similar to that in the base-case model, ranging from an incremental reduction in pharmacy spending of 1.0% to 1.2% for commercial plans and 2.0% to 2.7% for Medicare plans. Imatinib, the leading TKI in the treatment of patients with CML, is expected to be available in generic form in the United States on February 1, 2016. 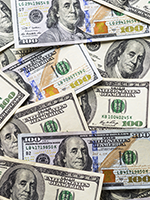 This change has the potential to result in significant cost-savings to payers. In the base-case model, it was calculated that for a 1 million member commercial plan, loss of patent exclusivity for branded imatinib produced cost-savings of >$6 million during a 2-year period, or 28.8% of the total pharmacy spending on the TKIs. The savings were even greater in the 1 million member Medicare plan (–$23 million, or –28.8%) because of higher rates of TKI utilization. Formulary management using step therapy through generic imatinib reduced the incremental TKI spending by 1.1% for the commercial plan and by 2.2% for the Medicare plan. 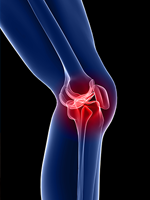 This is likely the result of the small number of new TKI users who would be affected by formulary management requiring step therapy through generic imatinib before treatment with a branded TKI. 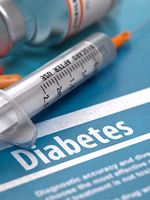 Secondary analyses showed that having a formulary management strategy that included the use of a preferred branded TKI in addition to the step therapy requirement would not substantially change the small cost-savings expected from step therapy alone in either plan. Sensitivity analyses of the base-case results were conducted to understand the economic impact of patient population, copayment versus coinsurance, and the existence of a 180-day period of marketing exclusivity for generic imatinib. The analysis of coinsurance versus copayment yielded results similar to those of the base case for both health plans. Adding a period of marketing exclusivity for generic imatinib resulted in slightly lower cost-savings on the TKI class compared with the base case. The substantial cost-savings for the general population were maintained when the sample was limited to a CML-only population—24.5% savings for each plan’s TKI pharmacy budget before imatinib’s loss of patent exclusivity. The model was developed for illustrative purposes to explore the impact of generic imatinib and formulary management on pharmacy spending for the TKI drug class. The main limitation of this study is that economic modeling involves a variety of assumptions regarding disease state, treatment patterns, and costs. Cost data included in the model are based on published sources and are not intended to represent actual pricing to any party. The budget impact estimates are for hypothetical commercial and Medicare health plans of 1 million members each, and the inputs and assumptions used in this model may not accurately reflect all health plans. Claims-based estimates for 1-year prevalence of TKI use were limited by the small number of commercial plan members aged ≥65 years who received a TKI (N = 86) and the small number of younger Medicare members (aged 18-64 years) who received this treatment (N = 45). The prevalence of TKI use for the base-case analysis was derived from claims data for TKI prescriptions regardless of diagnosis, and, therefore, included conditions other than CML. (Imatinib, but not nilotinib or dasatinib, also is indicated for other types of cancer.) This provides a more accurate assessment of the budget impact of TKI use in real-world settings. However, TKI dose and frequency of administration for TKIs were based on the labeled indication for Ph+ CML from respective US prescribing information, and variations of these parameters for other conditions were not considered in the present analysis. In this model, TKI use was considered to begin with the first prescribed TKI in the initial 1-year period and did not account for discontinuation of the first prescribed TKI within that year. CML is a chronic disease for which long-term treatment with TKIs is generally required to manage disease progression, and clinical guidelines recommend continuation of TKI therapy indefinitely in patients whose disease responds to the treatment5; therefore, the model assumed that patients would continue to use TKI therapy throughout the entire 2-year period of analysis. The assumption that 70% of patients treated with branded imatinib would switch to generic imatinib in the first year of its availability, and that 95% would switch by the second year, may be perceived as high in the context of CML, for which NCCN guidelines suggest maintaining the same TKI, at the same dose, indefinitely for patients whose disease responds to treatment. However, these guidelines do not address the availability of an FDA-approved generic medication with demonstrated equivalence (within an acceptable margin), nor do they reflect all indications for which imatinib is currently used in practice. Furthermore, it was assumed that the introduction of generic imatinib would have no impact on the number of patients receiving branded second-generation TKIs in the absence of formulary management, which may not reflect actual market shares after the approval of generic imatinib. It is possible that the availability of a generic TKI will result in some physicians selecting generic imatinib over branded second-generation TKIs. The decision to maintain consistent use of dasatinib or nilotinib, before and after the patent exclusivity period of branded imatinib, was made because of the relatively large market share of imatinib versus these agents, as well as the patient-specific scenarios for which a physician may select a branded second-generation TKI versus imatinib as first-line treatment for CML, such as based on Sokal score or BCR-ABL-1 mutation status.23 In the future, the availability of lower-cost generic imatinib may reinforce the large market share of imatinib relative to branded TKIs. Therefore, the impact of patent exclusivity loss for other branded TKIs is likely to result in smaller cost-savings than predicted for imatinib. Finally, this comparison of costs does not imply com­parable efficacy, safety, or interchangeability among the TKIs. Such comparisons are beyond the scope of this study. The availability of generic imatinib is expected to reduce the total pharmacy spending by nearly 30% for a 2-year period, independent of any formulary management strategies beyond substitution of the generic agent. 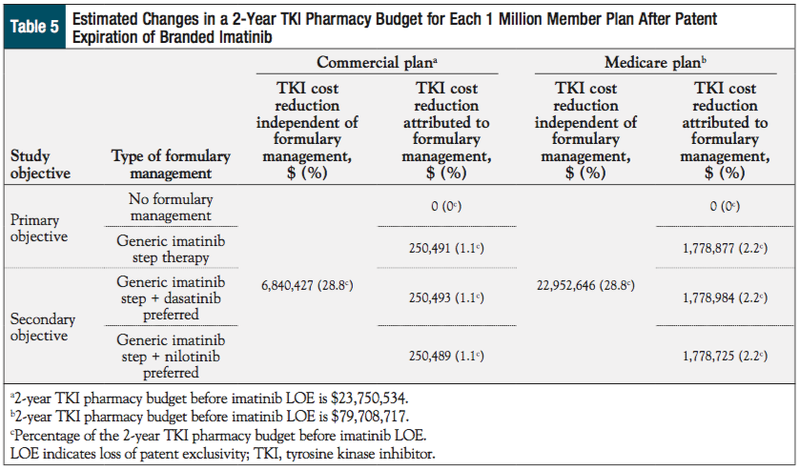 Given the low volume of patients newly initiating TKIs, formulary management of the TKI class through the use of PA for generic imatinib use before a branded TKI, with or without designating a preferred branded TKI, has limited potential for incremental cost-savings (1.1% for commercial plans and 2.2% for Medicare plans). The authors thank Vidya Moorthy, MS, of Mu Sigma (Northbrook, IL) and Arun Ravindran, BE, of Mu Sigma (Bangalore, India) for executing the healthcare claims database analysis used in this study. Dr Bloudek is a consultant to Bristol-Myers Squibb via Xcenda. Dr Makenbaeva is an employee of and owns stock in Bristol-Myers Squibb. Dr Eaddy is a consultant to Bristol-Myers Squibb. Part of this analysis was presented in abstract/poster form at the National Comprehensive Cancer Network 20th Annual Conference on March 12-14, 2015, in Hollywood, FL. Dr Bloudek is Assistant Director, Xcenda, LLC, Palm Harbor, FL; Dr Makenbaeva is Hematology Lead, Health Economics and Outcomes Research, Bristol-Myers Squibb, Princeton, NJ; Dr Eaddy is Vice President, Xcenda, LLC, Palm Harbor, FL. 1. DeSantis CE, Lin CC, Mariotto AB, et al. Cancer treatment and survivorship statistics, 2014. CA Cancer J Clin. 2014;64:252-271. 2. Howlader N, Noone AM, Krapcho M, et al, eds; National Cancer Institute. SEER cancer statistics review, 1975-2011. 2014. Updated December 17, 2014. http://seer.cancer.gov/archive/csr/1975_2011/. Accessed November 13, 2015. 3. Siegel R, Ma J, Zou Z, Jemal A. Cancer statistics, 2014. CA Cancer J Clin. 2014;64:9-29. Erratum in: CA Cancer J Clin. 2014;64:364. 4. Rizzieri D, Moore JO. Implementation of management guidelines for chronic myeloid leukemia: perspectives in the United States. P T. 2012;37:640-648. 5. Sawyers CL. Chronic myeloid leukemia. N Engl J Med. 1999;340:1330-1340. 6. American Cancer Society. Leukemia—chronic myeloid (myelogenous). Revised February 24, 2015. www.cancer.org/cancer/leukemia-chronicmyeloidcml/detailedguide/index. Accessed April 7, 2015. 7. Baran Y, Saydam G. Cumulative clinical experience from a decade of use: imatinib as first-line treatment of chronic myeloid leukemia. J Blood Med. 2012;3:139-150. 8. Kantarjian H, O’Brien S, Jabbour E, et al. Improved survival in chronic myeloid leukemia since the introduction of imatinib therapy: a single-institution historical experience. Blood. 2012;119:1981-1987. 9. Quintas-Cardama A, Cortes JE, Jabbour E, et al. Improved survival in chronic myeloid leukemia (CML) since introduction of imatinib therapy: a single­institution experience in 1,570 patients referred within 1 month from diagnosis. J Clin Oncol. 2011;29(15 suppl). Abstract 6557. 10. Gleevec (imatinib mesylate) tablets [prescribing information]. East Hanover, NJ: Novartis Pharmaceuticals Corporation; January 2015. 11. Sprycel (dasatinib) tablets [prescribing information]. Princeton, NJ: Bristol-­Myers Squibb Company; August 2015. 12. Tasigna (nilotinib) capsules [prescribing information]. East Hanover, NJ: Novartis Pharmaceuticals Corporation; October 2015. 13. Bosulif (bosutinib) tablets [prescribing information]. New York, NY: Pfizer Labs; September 2015. 14. Iclusig (ponatinib) tablets [prescribing information]. Cambridge, MA: ARIAD Pharmaceuticals, Inc; September 2014. 15. US Food and Drug Administration. Orange Book: approved drug products with therapeutic equivalence evaluations. Patent and exclusivity search results from query on Appl No 021588 Product 002 in the OB_Rx list. www.accessdata.fda.gov/scripts/cder/ob/docs/patexclnew.cfm?Appl_No=021588&Product_No=002&table1=OB_Rx. Accessed August 5, 2015. 16. Novartis. Novartis settles patent litigation on Gleevec (imatinib mesylate) with Sun Pharma subsidiary. Press release. May 15, 2014. www.novartis.com/news/media-releases/novartis-settles-patent-litigation-gleevec%C2%AE-imatinib-mesylate-sun-pharma. Accessed August 17, 2015. 17. LaPensee KT. Analysis of a prescription drug prior authorization program in a Medicaid health maintenance organization. J Manag Care Pharm. 2003;9:36-44. 18. Symphony Health Solutions. Dynamic Claims data. November 2013. Unpublished. 19. Centers for Medicare & Medicaid Services. Out-of-pocket maximum/limit. www.healthcare.gov/glossary/out-of-pocket-maximum-limit/. Accessed December 4, 2015. 20. Q1Group. 2016-2006 Medicare Part D standard benefit model plan parameters. www.q1medicare.com/PartD-The-MedicarePartDOutlookAllYears.php. Accessed December 4, 2014. 21. AnalySource Online. Syracuse, NY: DMD America, Inc. www.analysource.com/. Accessed March 27, 2015. 22. Olson LM, Wendling BW. The effect of generic drug competition on generic drug prices during the Hatch-Waxman 180-day exclusivity period. Bureau of Economics Federal Trade Commission working paper No 317. April 2013. www.ftc.gov/sites/default/files/documents/reports/estimating-effect-entry-generic-drug-prices-using-hatch-waxman-exclusivity/wp317.pdf. Accessed May 19, 2014. 23. Shieh MP, Mitsuhashi M, Lilly M. Moving on up: second-line agents as initial treatment for newly-diagnosed patients with chronic phase CML. Clin Med Insights Oncol. 2011;5:185-199. Generic Imatinib: Can It Provide Significant Cost Relief for Patients? In their article, Bloudek and colleagues discuss the potential impact of the loss of patent exclusivity for imatinib (Gleevec) in 2016.1 Oral oncology drugs, including Gleevec and its soon-to-be-released generic competitor, create time-consuming administrative burdens for provider offices that are often not reimbursed by payers. Providers’ sensitivity to drug costs may offer an advantage to generic imatinib, but the introduction of the generic drug is not the only available option for patients with chronic myelogenous leukemia (CML). Novartis dominates the $6-billion market for blood cancer drugs with imatinib and nilotinib (Tasigna). Dasatinib (Sprycel from Bristol-Myers Squibb) and bosutinib (Bosulif from Pfizer), among others, are also available for patients with CML. According to Andrew Weiss, analyst with Bank Vontobel, in Zurich, Switzerland, “Novartis’ strategy is to portray Tasigna as the best treatment on the market, so good that there will be talk about it being a cure.”3 If Novartis is successful, it may convince providers to prescribe the branded drug for their patients despite the availability of a low-cost generic. This tier structure, the report suggests, appears “not to be designed to encourage use of cheaper or more effective alternatives, but to extract the maximum patient cost-sharing for cancer drugs.”5 In this scenario, a lower-priced generic drug will still have a cost advantage over branded medications, because patients pay a percentage of the total drug cost; however, the advantage may not be as significant as a drug placed in a lower tier. Complexity and lack of transparency regarding drug coverage by exchange plans, however, may limit patients’ ability to make educated, cost-based decisions. Because exchange plans are administered by organizations managing Medicare Part D and commercial plans, patient cost-sharing trends will likely affect most patients. For patients facing heart-wrenching choices between life-saving medication and family necessities, lower-cost generic alternatives may be a welcome relief. 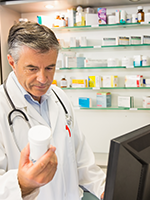 Patients who have begun therapy and have had positive outcomes with the originator drug, however, may be reluctant to switch to a generic drug. 1. Bloudek LM, Makenbaeva D, Eaddy M. Anticipated impact of generic imatinib market entry on the costs of tyrosine kinase inhibitors. Am Health Drug Benefits. 2015;8(9):472-480. 2. Shelley S. Bending the cost curve in oncology. Pharmaceutical Commerce. April 28, 2014. www.pharmaceuticalcommerce.com/brand_communications?articleid=27192&keyword=oncology-medical%20spending-cancer-healthcare. Accessed December 3, 2015. 3. Palmer E. Novartis wants Tasigna to cannibalize Gleevec to save its sales. FiercePharma. October 26, 2012. www.fiercepharma.com/story/novartis-wants-tasigna-cannibalize-gleevec-save-its-sales/2012-10-26. Accessed December 3, 2015. 4. Whalen J. Doctors object to high cancer-drug prices. Wall Street Journal. July 23, 2015. www.wsj.com/articles/doctors-object-to-high-cancer-drug-prices-1437624060. Accessed December 3, 2015. 5. American Cancer Society Cancer Action Network. ACS CAN examination of cancer drug coverage and transparency in the health insurance marketplaces. November 18, 2015. www.acscan.org/content/wp-content/uploads/2015/11/ACS%20CAN%20Drug%20Formulary%20Paper%20FINAL.pdf. Accessed December 7, 2015.